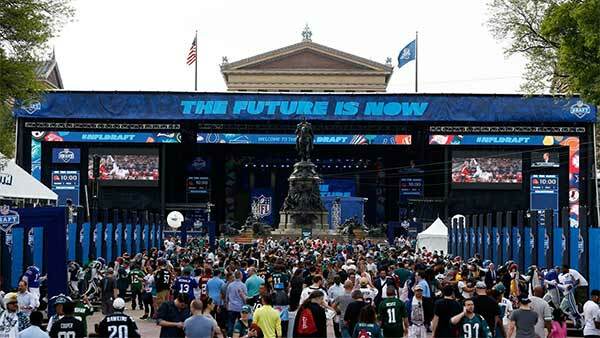 PHILADELPHIA (WPVI) -- The NFL Draft won't be coming back to Philadelphia next year. The league announced on Wednesday that the 2018 draft is going the Cowboys' AT&T Stadium in Arlington, Texas. It will be held April 26-28. "Philadelphia raised the bar by taking the Draft to another level, and this new opportunity in Dallas will enable us to continue the event's evolution and grow it even further," Goodell said in a statement. #BREAKING Ron Jaworski confirms to me that the #NFLDraft is NOT coming back to Philadelphia. Dallas will host the Draft in 2018. It's the first time the draft will happen in an NFL stadium. Virtually every NFL city, plus the Pro Football Hall of Fame site in Canton, Ohio, has expressed interest in holding the draft now that the league moves it around. After decades in New York, the draft was moved to Chicago in 2015 and was held there again in 2016. It drew huge crowds, whetting the NFL's appetite for taking bids to host it. Last year, the draft was in Philadelphia at the iconic Art Museum steps. It drew 250,000 fans for the first draft held outdoors.